This review was first published in the Aug. 11 edition of The Hamilton Spectator. Put away your smartphone the next time someone’s in the boardroom making a presentation. Not only is scrolling through emails, watching your Twitter feed and playing games bad manners. Your divided attention could also cost you a shot at the corner office or cut short your stay at the top. More than 4,000 college-educated professionals were asked to identify what makes or breaks a bid to join the senior leadership ranks within their organizations. Lose your smartphone or lose your executive presence was a recurring theme. “Tuning out to consult your smartphone elicited some of the most heated discourse in our focus groups and interviews,” says Slyvia Ann Hewlett, president of the Center for Talent Innovation and author of Executive Presence. So how do you show the people in a position to promote you that you’re leadership material? And how do you convince everyone else to follow you? Based on her research, Hewlett says executive presence is built on the three pillars of gravitas, communication skills and appearance. According to senior leaders, the top aspects of gravitas include confidence and grace under fire, decisiveness, integrity, emotional intelligence, vision and charisma. Hewlett says we want leaders who keep their promises, keep their cool and show compassion and courage in making the tough calls. Top communication traits include superior speaking skills, the ability to read and command a room, forcefulness and assertiveness, a sense of humour and a gift for small talk. “It’s the conversation before the meeting that establishes whether or not you’re worth listening to in the meeting,” said a senior executive interviewed by Hewlett. Anyone with corner office aspirations needs to read Hewlett’s book. She says what most of us can’t or won’t say to our colleagues. She catalogues career-limiting blunders and offers career-advancing solutions. There are also chapters specifically for women, minorities and members of the LGBT community. 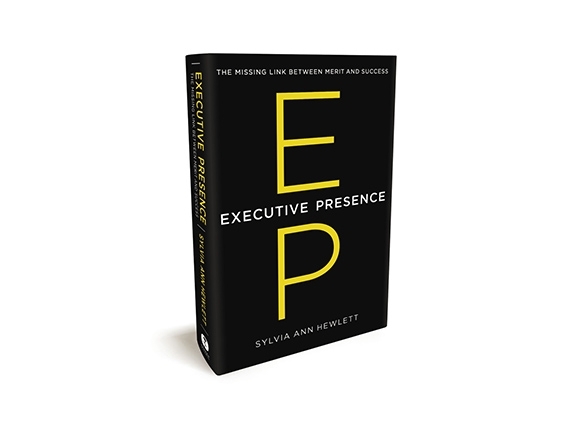 “Cracking the executive presence code will close the gap between merit and success, between where you are right now and where you could be if you unleashed your full potential and allowed it to fly and soar,” says Hewlett. So if you want to unleash your full potential, put away your smartphone and give your next presenter your full and undivided attention.